There is no marketing machine that could have accomplished what Keith Urban has in the last 14 years without what he’s got. And what he’s got, besides raw talent, is the unquantifiable, immeasurable “it” factor. July 21 at the Quicken Loans arena in Cleveland, Keith Urban lit up the arena for two and a half hours with his exceptional guitar playing and emotional songs, expressed by his enthusiasm for living! His well above average good looks don’t hurt either. Sitting in the 4th row right smack in the middle of the stage has it’s obvious advantages, but you really get a sense of what is going on up on the stage when you can see the expressions on the band’s faces and the apparent inside jokes. 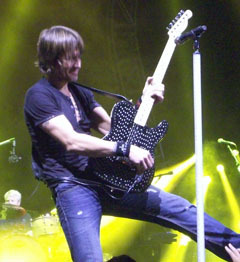 Keith Urban’s genuine hospitality shows through as if you are all personal guests who he has invited over for a foot stompin’, rawkus party, and much to the chagrin of the security staff, he encouraged everyone to get up on their seats! He took time to give a heartfelt thank you to everyone for spendingtheir hard-earned money to go to the show in these obvious challenging economic times, and he gave his band members their own chance to shine on stage. I’ve been back stage many times and can say Keith Urban is the same host when he is one-on-one, asking everyone’s name and truly interacting, not just a quick drive-by that some artists participate in. I have traveled to several cities to catch a show, have many autographed CDs and numerous photos with him, including the autographed photo of that fateful day in 1997 when I became his first fan (in my own mind)! But it’s hard to top the events that unfolded from the fourth row and after the show this year. Keith invited four random fans up on stage to sing “Kiss a Girl” solos, the best being a 9 year old girl named Madison, dressed in her cutest country outfit, complete with guitar that she knew how to play! I took pictures of the exchange, as I did throughout the night, but didn’t realize the extent of how special they were until I saw them in print. One image shows Keith helping her with a chord (hands backwards and upside down) all while he’s singing at the microphone. Again, raw talent and the “it” factor that leads him go the extra mile for the experience. Other photos show the unusual duo sharing the mic like seasoned professionals, and the last photo shows Keith beaming from the interaction and crowd response, again the “it” factor. After seeing the prints, and being inspired by the “Keith Urban attitude”, I knew I had to try to find this girl’s parents so they could have the once-in-a-lifetime experience captured in print. Impossible? I thought it could be possible that Keith knew the girl and could get them to her. So since I was in the music industry for 23 years, I sent them to Keith’s label, who forwarded to his management company. Another person offered to send them to the radio promotions department in case she was part of a radio promotion. Neither of these avenues turned up anything the first day. The next day brings a series of random events that were not planned and it’s still hard to believe they could unfold as they did. I had my concert photos in my gym bag to show some friends at the gym. As I left the gym I saw my former boss’s car in the lot of our former company, (he only goes there once a week and this was not his usual day). I stopped in to show him the concert photos, and on the way out I saw a woman I used to work with (again, this was not planned). 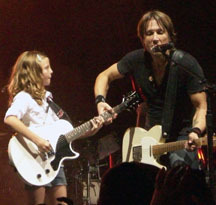 As soon as I asked if she wanted to see my Keith Urban concert photos, she blurted out that she read on Facebook that her high school friend’s daughter got to go on stage to sing with Keith Urban! Bingo, I found the girl’s parents! It felt like an Oprah moment, with that whole law of attraction phenomenon! It’s as if the lyrics “These are the days we will remember so take them by the hand…” were coming to life. Lesson? Nothing is impossible, live each day with positive enthusiasm and think about what you can do for others. You never know what random events might come together to make your day! Thanks, Keith, for a great show and inspiring fans everywhere!